An innovative and influential network of foster homes for stray cats and dogs in the Northwest suburbs is shutting down after 33 years, but its last president has started a new organization built along the same lines. Strays Halfway House, incorporated in Schaumburg in May 1981, was brought to an end by a vote of its board members this summer and is in the final stages of disbanding. Former president Peggy Aaland of Hoffman Estates, who said she was among two votes on the board to keep Strays running, has launched the new nonprofit – Home At Last Pet Rescue – to help replace the agency. Like its predecessor, the new organization is dedicated to finding foster homes and permanent adoptions for cats and kittens to keep as many as possible out of shelters that euthanize. Veterinarian Jeff Bloomberg, owner of Schaumburg Veterinary Hospital, said Strays Halfway House was one of the first in the region — possibly the first — to create a low-cost network of foster homes to look after stray animals, rather than a municipally run shelter. Such an efficient system allows more money to be spent on the animals themselves, he said. “They set the standard in a lot of ways,” Bloomberg said. Aaland said she’s been involved with Strays for the past 14 years, and even at the age of 64 she’s still willing to carry on with her husband, Ken. 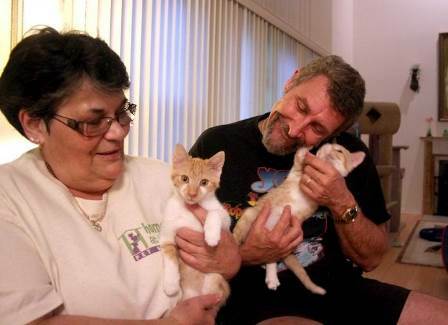 Others who served on the Strays board for nearly its entire 33 years were ready to call it quits, she said. The organization admittedly was winding down from what it had been, Aaland said. One of its two founding members is deceased, while the other has long lived in Florida, she added. “There were probably 20 to 30 homes in the years before I joined,” she said. Joann Gawlik, an officer of Strays Halfway House, declined to comment Monday on behalf of the organization. Aaland’s involvement in Strays began when she found a kitten in her backyard in Hoffman Estates and brought it to the attention of police. The kitten was brought to a local kennel, but just a few days later Strays Halfway House contacted Aaland about the possibility of her adopting it herself. The original mission of Strays Halfway House was to help both cats and dogs, but it was usually necessary — and expensive — to board the dogs at a professional facility. And paying for boarding expenses seemed to go against the philosophy of a foster home organization, she said. Her new organization, Home At Last Pet Rescue, is unfolding in an opposite manner. While she’s starting off focused only on cats and kittens, one of her early foster families has said that looking after dogs might be possible for them. Strays Halfway House had about $93,000 left in its reserves when it closed, with the intention of disbursing it to other animal care organizations, Aaland said. The money ultimately was divided among 21 groups, with her own receiving $2,000, Aaland said.